Andrea “Andie” Grant attended the National Catholic Youth Conference (NCYC) in 2005 and 2007. Her brother Luke participated in 2011 and 2013. This year, they were back at NCYC—as volunteers. 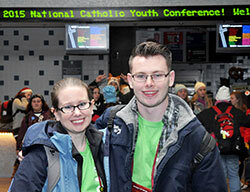 “I loved NCYC, and I’m a big believer in giving back,” said Luke, 19, of his reason for volunteering. Both young adults credit NCYC as part of the reason they are still active in their Catholic faith. Luke, a sophomore at Grand Valley State University in Allendale, Mich., is a member of his college’s Catholic student ministry team. “A lot of those people [on the team] went to NCYC,” he said. “You meet these people later on that are still passionate about their faith. Luke hopes to go into youth ministry after graduating. When that time comes, he considers leading youth groups to NCYC a must. “[NCYC] was a huge brick in the foundation of my faith life as a high schooler,” he said. “I would definitely take kids to it. As for Andie, she plans on volunteering at NCYC again.